We happened to visit the borough of Basingstoke and Deane today, October 29, 2010. It’s about 50 minutes train ride from London. The Borough Council is named after the largest town and the smallest village. The borough covers an area of over 245 square miles in North Hampshire of which over 90% is rural. Over 75% of the total area is agricultural or land in other non-wooded Greenfield use. A further 15% of the borough is covered by woodland or forest. Less than 8% of the borough is built up, supporting the majority of the borough`s population of just over 162,000 people. More than 60% of the population (around 105,000) live within the town of Basingstoke, which has grown to more than five times its size than half a century ago, extending into a number of adjoining parishes. It was perhaps the ideal time to visit the borough as the foliage was at its most colourful thanks to the autumn and I could capture the beauty and have posted it on the FB. At the National level- includes National affairs, Health, crime and welfare. The County level functions include Education, social service, Transportaion and libraries. The District level includes Planning, Housing, Environmental services and local administration and the Parish take care of the community service. We discussed a number of issues pertaining to Urban Local Bodies (ULB) in UK, their finances, planning and other such details which have relevance to India. One thing which has always frustrated me is that there is no higher level (one level up the local body) grievance redressal mechanism for Urban Local Bodies in India. Of course, most of the ULBs have a grievance redressel mechanism internally where in they try and attend to the complaints. Some of the bigger ULBs also have an online registration and tracking mechanism on grievances. But, it often happens that the complainant doesn’t get the proper response or is often given a very routine reply such as “your complaint has been attended to”. I have often noticed that complaints especially regarding town planning violations, encroachments and tax matters remain unresolved. As a result, the only option left, in the absence of a specific higher redressel authority, is either the Consumer court or the Civil court, both of which are time consuming process as these are not dedicated courts only for ULB and are already saddled and over burdened with lots of pendency from the past from all types of cases. It was during my interactions with the Civic officials that I came to know about Local Government Ombudsman in UK. There are three Local Government Ombudsmen in England, each dealing with complaints from different parts of the country . If the person has a complaint, it must first be filed with the local Council and if he is not satisfied with the council’s response, then a complaint can be filed with the Ombudsman. If the Ombudsman feels that the council has done something wrong, it aims to get it put right. The Local Government Ombudsmen (LGO) in England investigate complaints about local authorities and certain other bodies The purpose of the Ombudsman is to provide independent, impartial and prompt investigation and resolution of complaints of injustice caused through maladministration by local authorities and other bodies within jurisdiction and to offer guidance intended to promote fair and effective administration in local government. The LGO makes decisions independently of all government departments, councils and politicians by examining complaints without taking sides. The LGOs are appointed by Her Majesty the Queen and have the same powers as the High Court to obtain information and documents. The decisions are final and cannot be appealed. However, they can be challenged in the High Court on grounds of a legal flaw. Although, the LGO cannot order councils do what they recommend, there is no single case till date when the Councils have not followed their recommendations. The Ombudsman investigates complaints about most council matters pertaining to County, District and Parish level including housing, planning, education, social care, housing benefit, transport and highways, complaints against antisocial behaviour and council tax. The Ombudsmen's jurisdiction covers all local authorities (excluding town and parish councils); police authorities; school admission appeal panels; and a range of other bodies providing local services . The vast majority of the complaints the Ombudsmen receive concern the actions of local authorities and that is why they are known as the Local Government Ombudsmen. The Act also refers to limits on the Ombudsmen’s jurisdiction. On 1 August 2007 the Regulatory Reform (Collaboration etc between Ombudsman) Order 2007 came into force. In broad terms the Order enables the Local Government Ombudsman for England, the Parliamentary Ombudsman and the Health Service Ombudsman for England to work together collaboratively on cases and issues that are relevant to more than one of their individual jurisdictions. Examples of complaints that may fall within this category include the provision of health and social care; complaints about the administration of housing and welfare benefits; and complaints about some planning and environmental issues. The Local Government and Public Involvement in Health Act 2007, which came into effect on 1 April 2008, introduced more changes to the Ombudsman’s jurisdiction and operation. The main changes include enlarging Ombudsmen’s role by looking into service failure in addition to mal-administration, complaints about the procurement of goods and services are now within jurisdiction of LGO and that the complaints no longer need to be in writing. In the year ended 31 March 2009, 21,012 complaints and enquiries were received. The main subjects of complaints and enquiries received are housing (22% in 2008/09) and planning (18% in 2008/09). Other subjects include transport and highways, adult care services, children and family care services, benefits and education. Our investigators deal with all types of complaints and do not specialise in particular subjects. Council wise details are given in the site of LGO . Interestingly, there is something called Public Service Ombudsman watchers (as pointed out to me by Trever R Nunn ) whose objective is to is to motivate and help others to expose Public Service & Local Government Ombudsmen to public scrutiny. 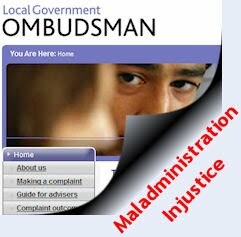 It specifically points out how difficult it is to get instances of maladministration from the LGO in UK. It is a kind of watchdog on Ombudsman which is a step ahead in the right direction. In India, Kerala is the only State (thanks Anup for pointing it out) which has set up an Ombudsman for Local Self Government. Though it does publishes its annual report, the details of complaints ULB wise are not available. The Government of India has designated several ombudsmen (sometimes called Chief Vigilance Officer or CVO) for the redressal of grievances and complaints from individuals in the banking, insurance and other sectors being serviced by both private and public bodies and corporations . In India, Ombudsman is called as Lokpal or Lokayukta. The central Government introduced the first Lokpal and Lokayuktas Bill in 1968 and lastly in 2005, which has so far not been enacted. I feel it is time we have an Ombudsman in India dedicated specifically for ULBs and likewise for all Panchayati Raj Insititutions (PRIs). Interesting, though I feel that it will be resisted by State Govts who would perceive the Ombudsman to be an encroachment on their oversight powers over local bodies. Ultimately it may become another bureaucracy. Existing laws and institutions in India are adequate, provided we respect them and allow them to operate. What is lacking is political and administrative will. NatWest Bank - to Bank or not to Bank?